Good news, folks, our member road signs have now been made and they look great! We will make them available to all members at no cost. BUT, we would really appreciate it if you could make an additional, one time $15 contribution with your annual membership renewal to help defray our cost of the signs. We will have them available for pick up at our annual meeting. If you aren’t able to attend the meeting, please contact the board member who lives nearest to you to arrange to get your sign. The signs will come with stainless bolts and nuts for your installation. Most of the signs have been drilled with holes to accommodate the old style posts shown in the picture . 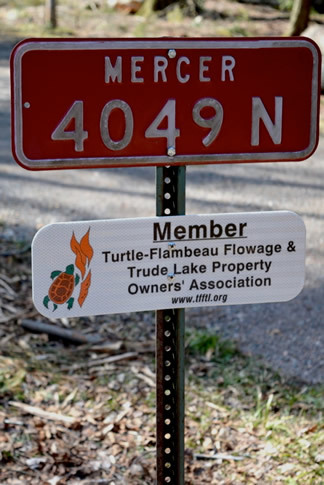 If you have a new, flag-style fire number sign, be sure to ask us for a flag-style member sign.